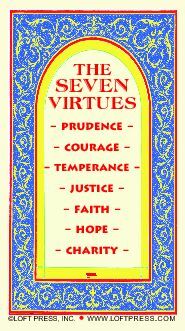 THE SEVEN DEADLY SINS is an ancient concept, as is the idea of Seven Virtues. Aristotle's Nicomachean Ethics lists several positive, healthy human qualities, excellences. Aristotle argued that for each positive quality there are two negative vices found on each extreme of the virtue. Courage, for example, is human excellence or virtue in facing fear and risk. Excessive courage makes one rash, while a deficiency of courage makes one cowardly. This principle of virtue found in the middle or mean between excess and deficiency is Aristotle's notion of the golden mean. Aristotle listed virtues such as courage, temperance or self-control, generosity, greatness of soul, proper response to anger, friendliness, and wit or charm. In AD 590 Pope Gregory I revised this list to form the more co on list. Gregory combined tristitia with acedia, and vanagloria with superbia, and added envy, in Latin, invidia. Gregory's list became the standard list of sins. Thomas Aquinas used and defended Gregory's list in his Su a Theologica. The Anglican Co union, Lutheran Church, and Methodist Church, among other Christian denominations, continue to retain this list. Moreover, modern day evangelists, such as Billy Graham have explicated the seven deadly sins. Most of the capital, or deadly, sins, with the sole exception of sloth, were defined by Dante Alighieri as perverse or corrupt versions of love: sloth is a deficiency of love; lust, gluttony, and greed are all excessive or disordered love of good things; wrath, envy, and pride are perverted love directed toward harm to others. In the seven capital sins are seven ways of eternal death. From lust to envy, all are generally associated with pride, which has been labeled as the father of all sins. NOTE: The foregoing is based partially on the Wikipedia article Seven Deadly Sins, where you can read much more. in a self-addressed stamped envelope (SASE). 9293 Fort Valley Rd., Fort Valley, VA 22652. When we receive it, we will send you ten cards in your SASE by return mail.